Your decorative logs and log tiles are sold in bundles. How many bundles will I need to fill my empty fireplace? Our bundles of display logs / tiles will each cover an area measuring 30cm x 30cm. We have devised a formula (in centimetres or inches) to calculate how many bundles you will require to completely fill a space - click here for further information. Are your natural decorative log products treated? All of our products are thoroughly dried to eradicate any insect infestation / prevent mould from forming - this results in logs that are ideal for interior use. We do not use any stains, varnishes or oils (with the exception of some options of our log tables). However, we are more than happy to implement a treatment of your choice (although this will incur an extra charge). Please see here for further information. Are your decorative log products suitable for outdoor use? Our natural wood log products are intended for interior installations and displays. If used outside, the logs will weather just as any untreated timber would. We can, if desired, apply a wood preservative for you at an additional cost. Please see here for more information. What type of wood are your decorative logs and log wall tiles? Our decorative logs and log wall tiles consist of a mixture of softwood; the majority of wood used is Douglas Fir, although other species may be included within your order. Do you supply any decorative logs with bark still on? At the present time, we do not carry stocks of natural logs with the bark remaining intact. Bark is fragile - most species will eventually lose the bark, even after the drying process. Our peeled natural logs will create a clean installation that maintains its appearance forever, with no crumbly mess at the bottom of the stack! 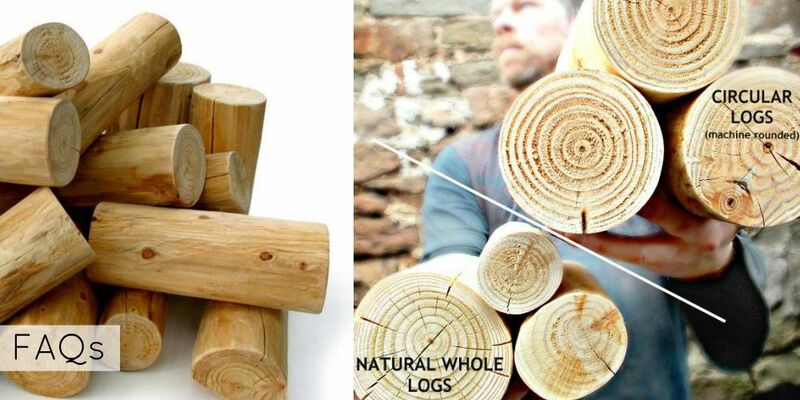 I'm not sure what the difference is between your Natural Whole Logs and Circular Logs? In essence, our Natural Whole Logs are left as true to the tree trunk's original state as possible. Therefore if the tree grew slightly unevenly, some logs cut from it will bear witness to that - they may be a little bent, or possibly slightly bigger at one end compared to the other. These logs are unlikely to be perfectly round - their diameters are dictated by the original tree's growth. This creates a random, highly textural pattern when the logs are stacked and viewed via their end grains. They stack very snugly together with minimal gaps between the logs. They are ideal for any size of installation, in large or small recesses. Our Circular Logs however are machine-rounded - each log will be as close as possible to a perfect circle (as close as the machine can make them). All diameters will be the same. This creates a log stack with a 'geometric' appearance when viewed via the end grains. The logs will want to stack in perfect rows and are likely to have bigger gaps between each log and at the ends of rows. They lend themselves to larger recesses in order for them to be stacked in obvious, neat rows. Both Natural Whole and Circular Logs have been peeled of all bark and are lightly sanded. What do I need to do with the decorative logs when I receive them? Our decorative logs will arrive ready to be installed. Simply unpack them and stack them into the recess, sit back and enjoy. * We would suggest that you use the 'half' logs provided in each bundle (not included in Circular Log or Split Log bundles) to neatly infill around the edges of the alcove, by placing the cut edge of the log flush with the flat edge of the aperture that you are filling. This will fill any small gaps at the ends of rows to create a tidy, tight-fitting log stack. * Please note - exceptionally large log installations may require a little support - do contact us for advice. I love the effect of your log wall tiles to replace wallpaper as a feature wood wall covering. Are they easy to install? Our log wall tiles are quick and super easy to install - no skills required! You might like to paint the backing wall in a charcoal colour, or indeed any colour of your choice, first. We recommend that you start from a low corner of a flat wall and work your way across and up the wall. We suggest you use a quality gap-filling adhesive - such as NoNails or similar - to bond the tiles to your wall. Squeeze a small amount onto the back of the tile, quickly spread it around in an even layer and offer the tile up to the wall. The glue dries quickly but you should have sufficient 'wiggle room' to arrange the tile in the perfect place. Use the half logs in each bundle (not included in Circular Log or Split Log bundles) to neaten edges. The cut side of the log should be placed flush with the edge of the wall, filling any small gaps effectively. (Don't worry - we include an Installation Advice information sheet with your order, to help you when you're ready to begin tiling). I want to create a piece of Log Wall Art. Are your log tiles suitable for this? Absolutely! You will need a backing board/panel that will be the base of the artwork - it should be prepared, ready to hang on the wall. Paint the panel in the colour of your choice, including the edges. Arrange the tiles either on the board or on a template to achieve a satisfactory arrangement. Once you are happy, use a quality gap-filling adhesive such as NoNails (or similar) to bond the tiles to the backing panel. Have a read of our notes in the answer above, too, for extra tips when gluing your log tiles into place. How do I look after the logs once they are installed in my home? Our decorative logs and log wall tiles will last a lifetime - all you need to do is install them and enjoy the lovely feature that they will create in your home. Once in a while you might like to flick a feather duster over them...but that's it! In the majority of cases, all standard decorative log/tile orders will be dispatched within 2 - 10 working days, via a 24hr courier service. Custom, large volume orders and log tables may take a little longer; we will advise you when you contact us. For further delivery information, click here. I work during the week - I am concerned that I will miss my delivery. Are Saturday deliveries possible? Our orders are dispatched via a 24hr 'sign for' courier service, Monday - Friday. Saturday deliveries can be arranged, however the delivery charge will be significantly higher. You are more than welcome to let us have details of a neighbour where your parcel may be left, opt for delivery to your workplace or nominate a 'safe' place - simply fill in the 'WILL YOU BE OUT ON DELIVERY DAY?' text box during checkout. If you would like to receive a notification text from the courier with an ETA (available on the morning of the delivery only), kindly enter a contact mobile number at checkout or contact us with your mobile number. I have ordered several bundles of decorative logs / log wall tiles, however I have only received one box. Is this correct? We try to minimise packaging whenever possible. Often, several log bundles are packed in layers, within one box - one bundle on top of another. Therefore, it is possible that three bundles of logs (for example), might be delivered in just one box. I'd like to order some display logs but I don't live in the UK. Can you help? We currently deliver our decorative logs and log products to any country within the EU, however different postage rates may apply. Delivery to Northern Ireland is available at no extra charge; delivery to Southern Ireland is possible, however again postage rates will vary. More information regarding our delivery policy is available here. I am wondering about altering the colour of the natural logs. Could I have a stain (or other finish) applied to your decorative logs / log wall tiles? Can I create a bespoke Colour Mix palette to suit my furnishings? You certainly can - see here for further information. Do you supply your decorative logs and log wall tiles in bulk for trade applications? We do! Take a look here for more information on large volume orders. I'm looking to purchase a large amount of decorative logs / log wall tiles. Do you offer a discount? Discounts may be offered, depending on order conditions - mainly quantity required, product type and time frame. Kindly contact us to discuss your requirements with us.